Known for its lush landscapes and tantalising culture, Malaysia is one of the most sought after tourist destination. This haven is just a click away from you because all you require is a Malaysia visa which can be obtained in a few simple steps. Don’t let your enthusiasm fizzle out, process your very own Malaysia visa within days with our quick and hassle-free process, all yours at just 10% initial payment. Want to know what you are up against? Refer to this comprehensive article to quell all your queries. Which is the Malaysia visa that suits your need? Sticker visa – Used for Long-term visits such as education or employment. Online visa – Used for brief business visits and tourism. It is easy to obtain and does not require you to visit the local Malaysian embassy. We are about to discuss in detail on how you can procure your Malaysia visa online with ease. To aid you in selecting the best visa option available tailored to your need, we are providing the following table for you to read through. We suggest that you opt for a Malaysia eNTRI visa if you plan to apply for a visa, from India, for a to and fro trip to the country spanning 15 days or less. How much should I pay for a Malaysia visa? Out of all the websites we have come across, the following breakdown of cost for a Malaysia visa has been by far the best and most cost-effective approach. You can expect to save an amount close to INR 600 if transacting with windowmalaysia, as compared to the above-mentioned rates. But you might be putting yourself under risk of rejection due to photo issues, and also increased hassle. A) evisamalaysia.in– You are only required to pay 10% of the visa fee initially and the rest can be transacted after visa approval. Even more of a reason to opt for this channel would be because they can get you a visa even if you are yet to book your flight tickets and hotel bookings. Over 10% of Malaysia visas are rejected due to this oversight. B) windowmalaysia.my- This is the Official website for a Malaysia visa, but are frequently heard to execute poor implementation. It is known that visas can get rejected if you do not know what you are doing. 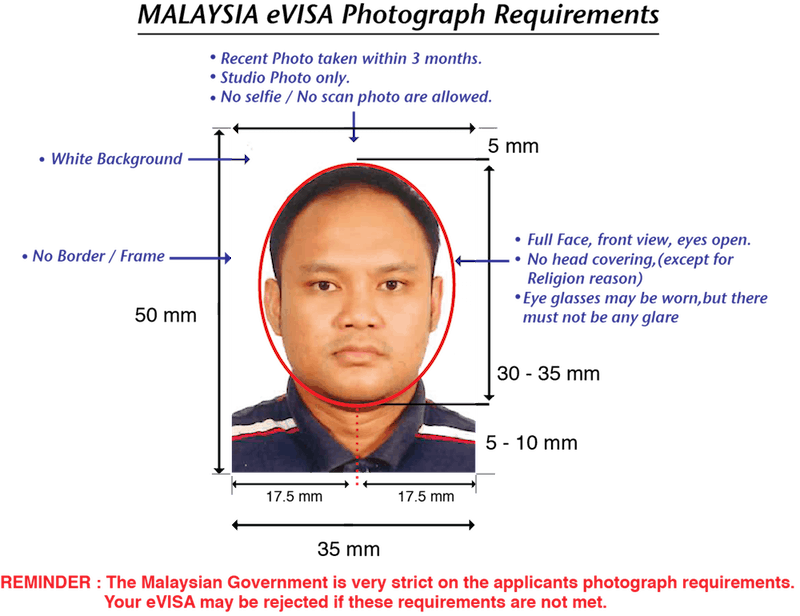 If you choose to apply for a Malaysia visa by yourself, please keep in mind that the photo you are submitting sticks to the parameters specified from the image we have provided below. There is also the possibility of being summoned by the embassy for an interview at any of their centres spanning Chennai, Mumbai or Delhi. Also, you risk a higher rate of rejection due to issues that can come up in various documents you provide. Our agent pays attention to details to ensure your application gets accepted without any issue. In one such case, they had adeptly modified an iPhone portrait pic with reference from the passport pic, tailoring it to meet the requirements for a Malaysia visa. The agent has also provided us with the following images as guidelines for the documents you need to submit, elaborately explaining each point. How to apply for the Malaysia visa? A) Via an agent- evisamalaysia.in- You are only required to pay 10% of the visa fee initially and the rest can be transacted after visa approval. Furthermore, you must opt this channel because they can get you a Malaysia visa even if you are yet to book your flight tickets and hotel bookings. More than 10% of Malaysia visas are rejected due to this oversight. B) Via the official website- windowmalaysia.my- This is the Official source for a Malaysia visa, but you are all on your own to figure out where goes what. Click on the link and open it in a new tab. Notice the Malaysia visa application form as shown in the following image. Proceed to fill the visa form. Select a Malaysia visa type that suits your need. In case you are unsure what visa fits your need, you don’t have to fret, you can change it after speaking to their agent. All you need to fill is your basic information. There is no payment required while filling the form. The agent will contact you to explain the process. You can check your email for the confirmation mail. Later on, you are required to make a 10% payment to initiate the process for a Malaysia visa. And thereafter you can call up the agent anytime to enquire on the status of your visa. You will also periodically receive SMS informing you about your Malaysia visa status. As soon as your visa gets approved you will be contacted with the official details. You are required to make an account before you proceed for an eNTRI visa and you are allowed to apply only for one eNTRI Malaysia visa per account. To put that in perspective, if you require Malaysia visa for 10 passports, you need to possess 10 different accounts each one made using a unique email. Go to windowmalaysia.my, the official website for Malaysia visa. Keep in mind that it is ‘.my’ and not ‘.com’. 2. Press the ‘apply online’ button. Go for the “I am New” option. You have entered the passport information. Take a look at the image provided below of a sample passport. Follow the guidelines carefully while filling the form out. After the account has been created, you will be sent an email containing all the details required to proceed ahead with you Malaysia visa application. Go to the official website for Malaysia visa. You can find the link to check the status of your Malaysia visa here. Enter your sticker number provided to you in your eVisa, on the adjoining field. Your information should be accessible if all the details you have provided has been accurate. It is also proof that your Malaysia visa has been approved. How long should I wait for the approval of my Malaysia visa? The Malaysia eVisa requires a processing period of 3 working days at the most in India. Holidays of both the countries, India and Malaysia are to be taken into consideration. The days are calculated from the time your applied Malaysia visa is acknowledged. Whereas, Malaysia eNTRI visa can be obtained immediately if all the information provided is filled accurately. In this case, you can expect to procure a Malaysia eNTRI visa even within 2 days before your scheduled departure. Additionally, the embassy has all the rights to call you for a personal interview or request additional documents such as bank statements. Brace yourself for all kinds of outcomes. Are Indians eligible for a Malaysia visa on arrival? Which is more preferable- Malaysia visa online or Malaysia visa on arrival? A) Holding a valid tourist visa for either Thailand, Singapore or Indonesia. B) Holding a valid return ticket back to India. C) In possession of at least USD 1000 as proof of sustenance during your stay in Malaysia. Addressing our next question. It is always advisable to follow the more safe, easier and cheaper option while travelling to a new country. Eliminate the risks that you might have to face with a short notice visa on arrival. With Malaysia visa online you can get your Malaysia visa before you plan your travel, ensuring a hassle-free relaxing trip for you. Do you need a Malaysia visa to visit Malaysia? Many visitors to Malaysia require a Malaysia visa before travelling to the country, however, it is really important to check information specific to your country before travelling. There are some countries that do not require a Malaysia visa and on arrival, these nationals will be provided with a permit to stay for a defined period depending on their nationality. An important point to note is that you are required to possess a passport that is valid for 6 months after your departure date, regardless of if you require a Malaysia visa or not. How can I get a Malaysian visa if I am a tourist? You can procure a Malaysia visa as a tourist, also known as Visa without Reference (VTR) at any of the nearest Malaysian Representative Office Abroad. Applications for a Malaysia visa can also be made online through I-Visa System (Applicable for tourists from India and China only). Generally, tourists opt for a Single Entry visa to Malaysia. It is normally valid for a single entry and for a period of three (3) months from the date of issue. There is also the option of Visa on Arrival(VOA) facility available to select nationalities under certain circumstances. Can one get a Malaysia visa on arrival? Malaysia only offers Visas on Arrival under very specific conditions that too for select nationalities. 1. Valid visa from the third country. 3. In possession of at least USD1000 cash money to show proof sustenance during the stay. However, instead of a full-fledged Malaysia Visa, you may apply for a Transit Without Visa (TWOV), also known as a Transit Pass for a maximum duration of 120 hours (5 days) while on transit to a third country. How do I apply for Malaysia visa? All Malaysia Visa applications must be made at any the nearest Malaysian Representative Office Abroad. Before applying it is important to understand what type of Malaysia visa you must apply for. There are two types of Malaysia visa depending on the purpose of your visit, the most common being Visa Without Reference. This is required for the purpose of a social visit to the country. The latter type of Malaysia visa is known as Visa With Reference, which is required for students, those who arrive seeking employment and their dependents. How long does it take to get a Malaysia visa? The time is taken for processing a Malaysia visa after you have submitted it varies from country to country. It also largely depends on the source via which you are applying for the visa for Malaysia. How much does it cost for Malaysia visa? The fee for a Malaysia visa relies on the type of visa you are applying for and the country from which you belong. For example, the fee for a single entry to the country and multiple entries differ, so does the fee for a transit pass. You can find this information easily from the official portal of the immigration department of Malaysia. How can I check my Malaysia visa online? There is an online application platform enabling foreign nationals to apply for an electronic Malaysia visa at convenience. This is known as eVisa, granting certain nationalities the eligibility to conduct so. You can check the status of your visa online by providing the details on the official website, namely your ‘passport number’ and your ‘Malaysia eVisa sticker number’ you have been given while registering. You should be able to see the status of your visa online after following these steps. What is OSC fee Malaysia visa? One Stop Centre (OSC) is an innovative one-stop centre created to provide centralized customer service on behalf of Malaysian Authorities. These centres are outsourced by the government for visa processing. Hence, applicants will now have additional total costs to bear over the Visa fees, which is the Processing fees for the OSC. 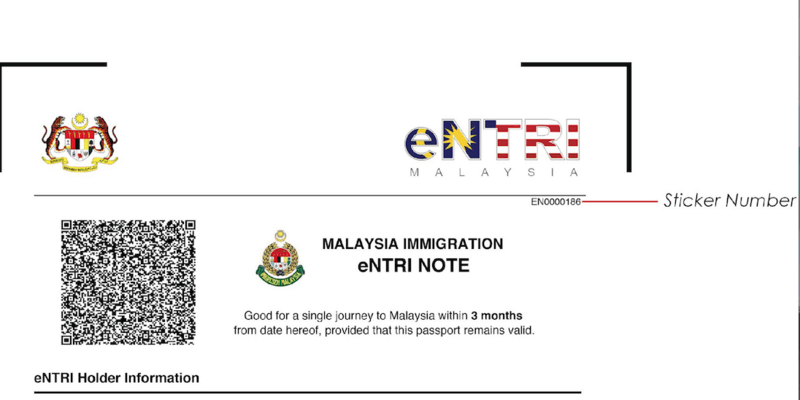 What is eNTRI visa Malaysia? Provided by the Government of Malaysia, Electronic Travel Registration & Information (eNTRI) is an online registration facility to facilitate the entrance of Indian Nationals into Malaysia under the Visa Waiver Programme. All Indian Nationals in India and expatriates residing all over the world excluding Singapore can apply for this Malaysia visa waiver programme. An eNTRI holder is entitled to a maximum of 15 days for each visit. Each application can only be used once. No extension is allowed. Upon completion of registration, applicants are required to print out the eNTRI Note, which must be presented upon arrival in Malaysia. For a Malaysia visa under the category Transit Without Visa (TWOV), what is the maximum duration of stay? Instead of a full-fledged Visa, you may apply for Transit Without Visa (TWOV), also known as a Transit Pass for a maximum duration of 120 hours (5 days) while on transit to a third country. The TWOV facility is only available at the Kuala Lumpur International Airport (KLIA) and Low-Cost Carrier Terminal (LCCT). It can be noted that there will be no extension of Transit Pass, in that case, you must apply for a Malaysia visa. Also, Foreign nationals on transit who continue on their journey to the third country without stepping out of the airport premises on the same flight do not require a transit pass or a Visa.